Helen Audra Foglesong, 94, died on Sunday, October 28, 2018 surrounded by her loving children at the New Homestead in Guthrie Center, Iowa. Helen spent her entire life in Guthrie Center, Iowa and married Darwin Foglesong on June 11, 1943. They were married for 60 years when Darwin passed away on November 9, 2003. They bought a house on Prairie Street where they lived until Helen entered the assisted living portion of The New Homestead in October of 2013. She then moved upstairs in 2015 and remained there until her death. She enjoyed the activities and the people at the New Homestead and it was a great place for her to live. Helen enjoyed taking trips with her husband Darwin, traveling to many State and National Parks. They loved to go camping with their favorite trip being when they drove and camped in their pickup camper in Alaska. One of their favorite past times was to take rides around the countryside and enjoy the beauty of the great outdoors. Helen was a member of the First Christian Church in Guthrie Center and spent many hours helping with lunches at the church. 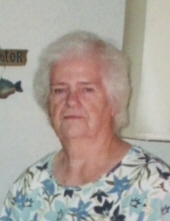 She served on the Board and also served as the Treasurer of the Board for a number of years. She spent many hours cleaning and maintaining the church over the years. Helen loved when her family could all get together. Christmas Eve was a favorite time for the entire family when everyone gathered at the family home. She loved to bake and this skill was greatly appreciated by those that ate the goodies. She also loved to play cards and before the death of her husband, they spent many hours at the kitchen table playing Skip-Bo. They passed their love of these games and cards on to their children and grandchildren. Helen was proceeded in death by her husband, Darwin, sons: Don Foglesong and his spouse Linda, David Foglesong and his spouse Betty Lou, grandson Brian Foglesong and great grandson Gavyn Webb. Survivors include her daughter, Jolene Webb (Ted) of Woodbine, IA and son Bruce Foglesong (Connie) of Linden, Iowa; grandchildren: Tracy Krueger, Terri Young, Scott Foglesong, Steve Foglesong, Lance Webb, Eric Webb, Tyler Webb, James Foglesong, Mikel Wierick and Chrisi Hutchins. Helen is also survived by 23 great grandchildren and many nieces and nephews. Services will be at 10:30 AM on Saturday, November 3, 2018 at the First Christian Church in Guthrie Center, Iowa. A private burial of cremated remains will take place after the memorial services. To send flowers or a remembrance gift to the family of Helen Audra Foglesong, please visit our Tribute Store. "Email Address" would like to share the life celebration of Helen Audra Foglesong. Click on the "link" to go to share a favorite memory or leave a condolence message for the family.